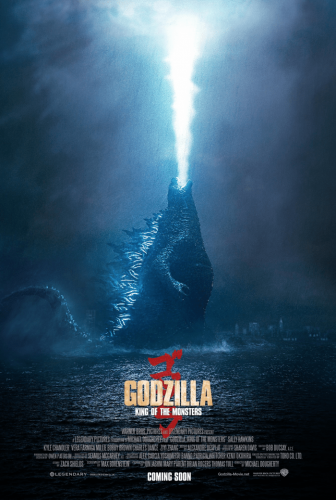 There Goes the Neighborhood: ‘Godzilla: King of the Monsters’ Is Back! Godzilla is back and he’s brought all kinds of bad company in Warner Bros. first trailer for Michael Dougherty’s (Trick ‘r Treat) Godzilla: King of the Monsters, a sequel to Gareth Edwards (Monsters) 2014 blockbuster. Joining Godzilla in the monster mayhem are giant insect Mothra, winged beast Rodan, and three-headed flying dragon King Ghidorah. Fighting for mankind are milfy Vera Farmiga (”Bates Motel”), Millie Bobby Brown with hair (”Stranger Things”), Sally Hawkins (Shape of Water), Ken Watanabe (Inception), O’Shea Jackson Jr. (Ingrid Goes West) and Charles Dance (”Game of Thrones”). In theaters May 31, 2019.